Original Sin Art: Juvenilia, "Love", 1999. This was my final exam piece for my Art A-Level back in 1999. It was only my second attempt at painting something large-scale on canvas, at the request of my wonderful Art teacher, Mrs Barratt. There were a list of themes that we could choose from, and I chose Interchangeable Elements, because straightaway it made me think of the four "original" elements, Earth, Air, Fire and Water. I had done other sketches and even a pottery piece involving these elements over the years, and it was a topic I knew I would enjoy exploring. I eventually settled on this couple for my final piece, Fire and Ice. I was in my first serious relationship at the time, but always felt that I loved him way more than he felt for me, which influenced the figures. 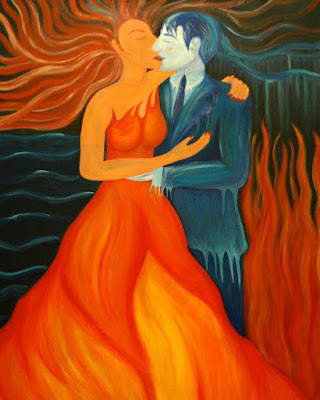 I felt myself to be the lady on fire, just burning up with unrequited and passion, while he was the ice man, cool, calm, and collected. And no matter how brightly I burned, it would never melt his heart and make him really warm to me. I called the piece "Love", and it hung in our school hall for several years before I finally persuaded them to let me take it home. It traveled with me from England to America, but is currently not on display, as we don't have a wall big enough in our house! I know art is completely subjective, but it has been interesting to hear other people's takes on what this painting means. Most often, people tell me that they see the male figure melting in the female's embrace. I choose not to tell them that that is the opposite of what I intended! In fact, the female is slowly turning to ice too, as you can see in her hair on the top right of the painting. I never actually got around to completely finishing this painting. There was a time constraint in the exam, and then I wasn't allowed to touch it before it was examined... then it was hung up for years! By the time I got it back in my possession, I was scared to touch it, but one of these years I will finish the female's face and hair! "Love" by Original Sin Art, 1999. Acrylics on Canvas.